Higher economic growth in Africa leads to an expansion of the manufacturing sector and an increase in industrial energy use because of possible regional competitive advantages. 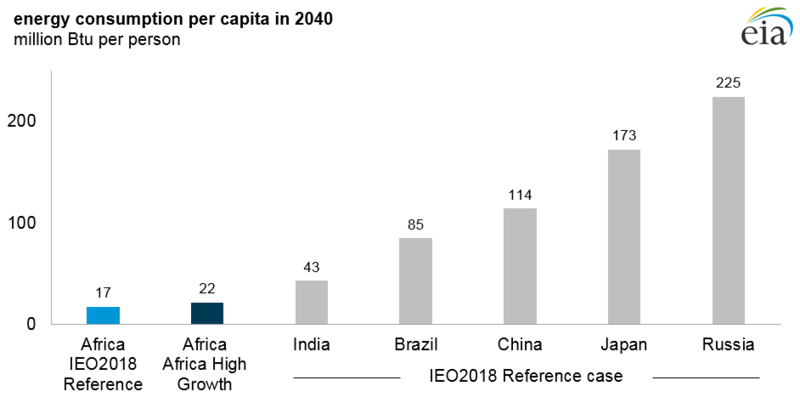 Higher assumed economic growth over the projection period leads to African energy consumption per capita that is about 30% higher than in the IEO2018 Reference case in 2040. The IEO2018 Africa side case highlights the need to further explore the relationship between projected changes in GDP and the response of energy consumption, particularly in the industrial end-use sector. The growing gap in GDP per capita between Africa and other regions highlights the potential for faster African economic growth. Further infrastructure development, particularly transportation network development and electrification, could alter this projection. Africa’s manufacturing sector share of total output was one-half the share in India and only one-third of China’s share in 2015. Africa’s construction, services, and agriculture output shares were similar to those shares in rapidly growing India in 2015. Africa’s mining output share was larger than that of both China and India in 2015 because of abundant natural resources and the underdeveloped state of many African economies. EIA simulated an economic growth case where Africa’s economy grows 5.0% per year on average through 2040 instead of the IEO2018 Reference case average of 3.8%. In the Africa High Growth case, higher GDP growth is primarily driven by higher private investment and personal consumption. 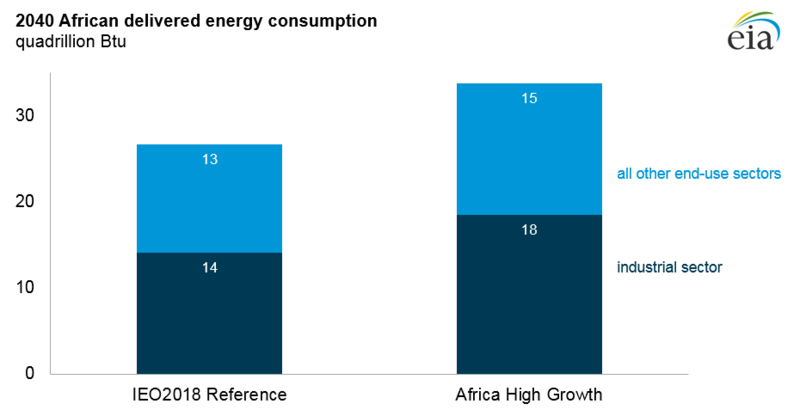 Higher economic growth in Africa increases projected energy consumption per capita by 2040; however, it decreases in the IEO2018 Reference case. Even with additional growth in energy use, African energy consumption never reaches the level of other major economies in 2040. Higher economic growth in Africa results in an increase in the size of the manufacturing sector relative to the services sector. The manufacturing share of output increases the most because Africa’s economy more effectively employs its population, urbanization, and natural resources to broaden its industrial base. 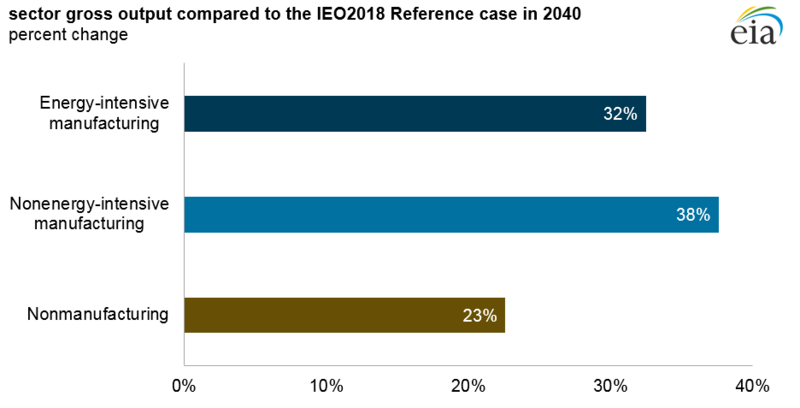 Energy use in the Africa High Growth case is 22% higher than the IEO2018 Reference case in 2040. The industrial sector accounts for more than half of the increase in energy use from 2015 to 2040 in both the IEO2018 Reference case and in the Africa High Growth case. Increased living standards as a result of higher economic growth increase energy use in other sectors. 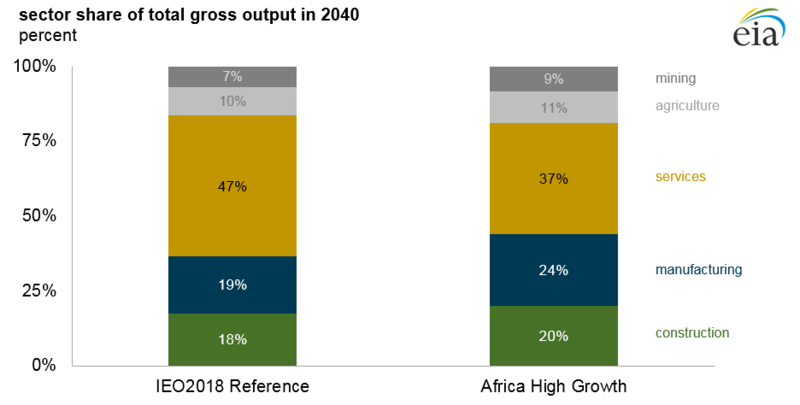 African economies account for a larger manufacturing share in 2040, with percentage increases in output for both energy-intensive and nonenergy-intensive manufacturing industries that exceed 30% compared to the IEO2018 Reference case. Nonmanufacturing industrial output grows more slowly, rising by 23% compared to the IEO2018 Reference case in 2040. Manufacturing drives the largest energy changes by 2040 in the Africa High Growth case. Energy use for nonenergy-intensive manufacturing increases the most as a percentage. African countries have a competitive advantage in manufacturing because of low-cost labor and natural resource availability, which can displace output in other regions of the world. Higher African economic growth decreases manufacturing output in competing regions such as other non-OECD Europe and Eurasia. Industrial economic activity in the Middle East in 2040 increases relative to the IEO2018 Reference case as higher African growth increases demand for fossil fuels. EIA’s International Energy Outlook 2018 (IEO2018) is a supplement to the IEO2017. The IEO2018 Reference case updates the IEO2017 Reference case with macroeconomic information, but there are no modeling changes to other end-use sectors. IEO2018 focuses on macroeconomic uncertainty by conducting sensitivity analyses in three IEO regions: China, India, and Africa. These are projected to be three of the fastest growing and most populous regions in the IEO2018 Reference case, and there is significant uncertainty regarding their future economic growth.